Skin Deep Salon and Spa Goes Blue! Join them on Sunday, March 24 from 10 a.m. to 3 p.m. for spa treatments, silent auction, food, refreshments and fun. 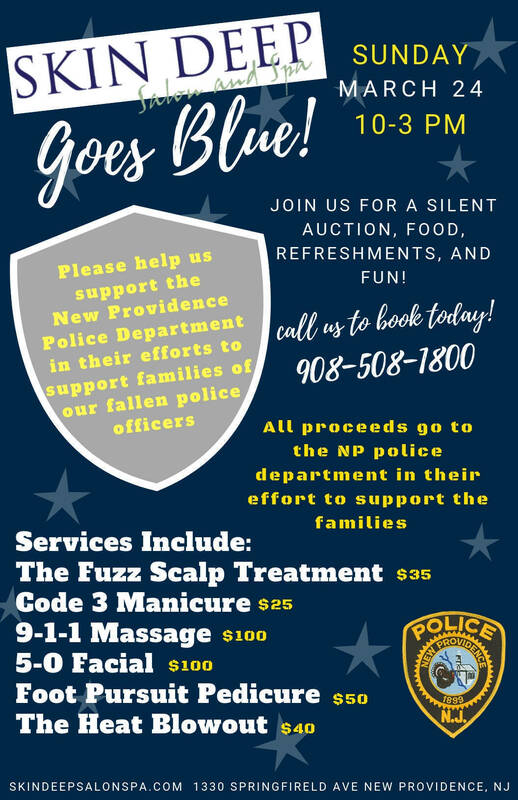 The event benefits the New Providence PBA 132 in their effort to raise money in support of families of fallen police officers during "Police Week 2019" in Washington D.C.
New Providence PBA 132 is on a mission to help out the families of fallen Officers. Last year, several New Providence Police Officers rode bicycles to Washington DC to honor fallen Officers. In 2019, New Providence PBA 132 will be renting a tent space inside Police Week in Washington DC to sell items (challenge coins, thin blue line apparel) to raise money for families of fallen Officers. 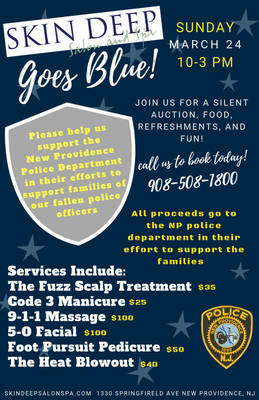 New Providence officers will be traveling this May on their own time and using their own personal money.